Imagine one of those rare, warm, still, clear evenings on the Music Concourse, between the De Young Museum and the Academy of Sciences,in San Francisco’s Golden Gate Park. With beautiful museums flanking, a centerpiece of fountains and dozens of beautifully sculpted trees providing cover, the sunken Concourse is beautiful in the warm, autumn night. Now imagine a thousand white-clad, champagne-swilling, food-obsessed Bay Area revelers waiving white napkins, toasting friends and munching on thousands of different picnic nibbles in the waining, pink dusky light. Cafe music ushers in the darkness of night and thousands of candles (mostly flameless) dapple the scene with romantic low light as flying paper lanterns rise up over the crowd into the night sky. People dance or take a stroll, illuminated by ambient light. Throughout the evening, corks pop, glasses clink and picnickers laugh and eat. Is this heaven? Ah, no. This is Le Diner a San Francisco, the City’s first effort at reproducing the famous Parisian Le Diner en Blanc. A sort of by-invitation-only flash mob, with a little costume party thrown in along with a good bit of decorative arts and fashion fetish to make it all fun, this is an event that will undoubtedly be harder to score entry to in the years to come. 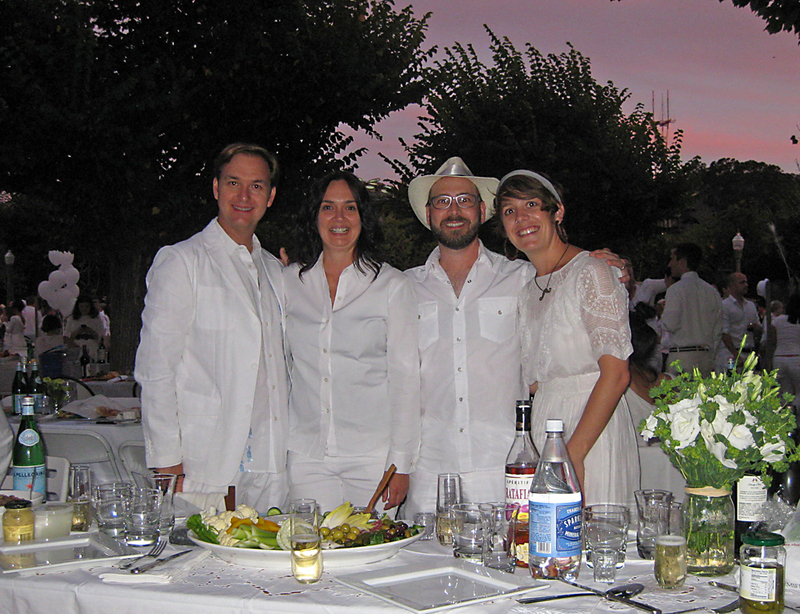 Dressed in white linen and cotton, the crowd enjoyed a remarkably comfortable night out of doors. The pop-up picnic organizers did a great job. Bien manger et de bons amis! We owe a debt of gratitude to Kris Corzine for inviting us to join her and friend Val, and for supplying much of the setup, including the flowers and table linens, a delicious Aperitif Ratafia plum liquor from the Perigord, foie de canard from the Dordogne (bought and brought from La Boutique de Badaud in Sarlat, France) and lentil salad a la KC. We supplied the crudité, anchovy-stuffed olives from Spain, charcuterie from Boccalone and a “tilted” four layer coconut rum cake. We all brought bottles of bubbly and still white wine to wash it all down. 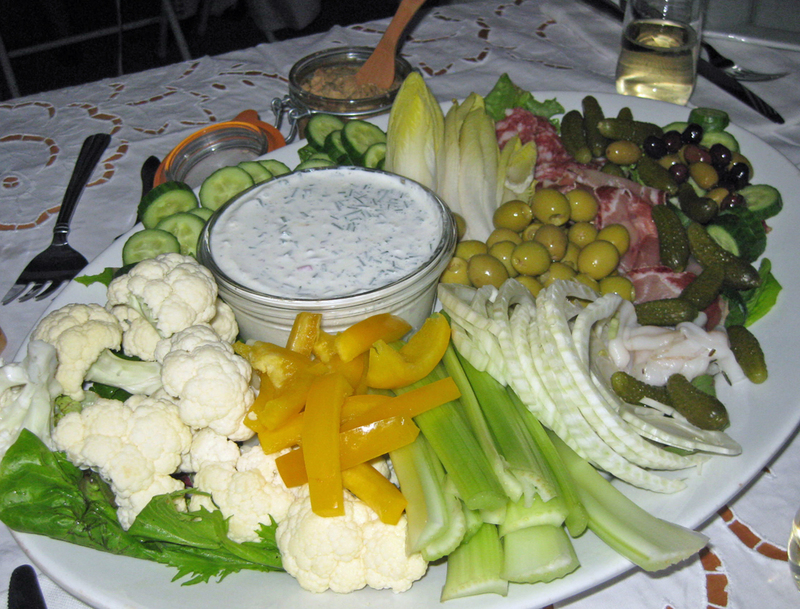 A semi white array of crudite and more. After three short hours of feasting, the party ends and everyone gathers up their stuff, leaving no trace and ghostly white parties slip into the dark of the park as they make their way home. 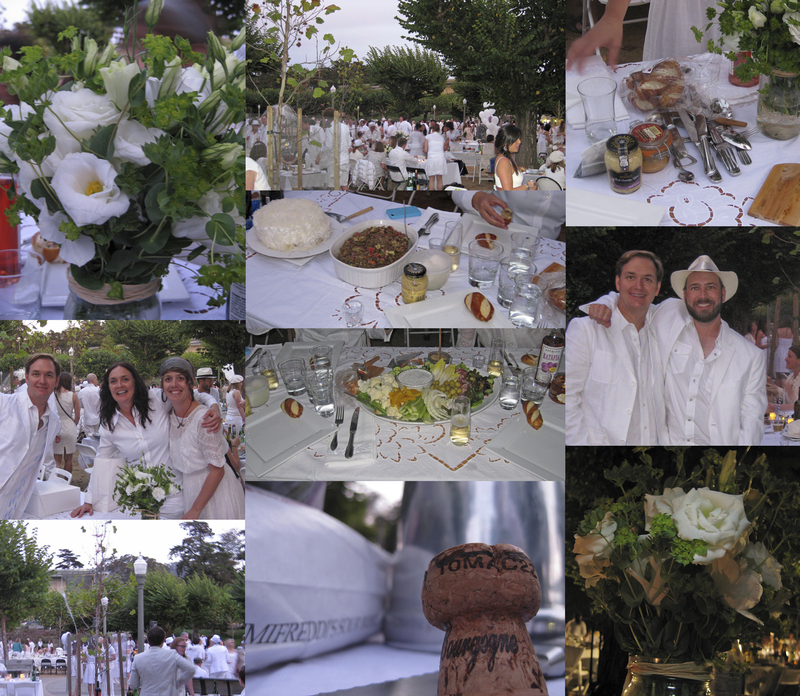 It may not have been an evening picnic in heaven, but this year’s Le Diner a San Francisco was a smashing, heavenly success! Prepare the coconut rum pastry cream the night before. If you try to throw the whole thing together in a day, and you’re pressed for time, you’ll end up with a “tilted” cake, or worse. The cake and frosting recipes are from Martha Stewart (with minor adjustments) and the pastry cream is Jason’s, inspired by a combination of Martha’s and Ayse Dizioglu of Polka Dot Cake Studio in N.Y.C. via I like you, by Amy Sedaris (a must for entertaining). Heat the oven to 350 degrees. Arrange two racks in the center of the oven. Line the bottom of three 6-by-2-inch (or two 8-by-2-inch) buttered round cake pans with parchment paper. Dust the bottom and the sides of the cake pans with flour, and tap out any excess. Sift together flour, baking powder, baking soda, and salt, and set the bowl aside. In the bowl of an electric mixer fitted with the paddle attachment, cream butter on medium-low speed until fluffy, 1 to 2 minutes. Gradually add sugar, and keep beating until the mixture is fluffy and light in color, about 3 minutes. Gradually drizzle in egg yolks, beating on medium-low speed between each addition until the batter is no longer slick. Beat until the mixture is fluffy again, about another 3 minutes. Alternate adding flour mixture and sour cream to the batter, a little of each at a time, starting and ending with the flour mixture. Beat in vanilla. Divide the batter between the prepared cake pans. Bake until a cake tester inserted into the center of each cake comes out clean, 30 to 40 minutes, rotating the pans in the oven, if needed, for even browning. Transfer cake pans to wire racks to cool, about 15 minutes. Remove cakes from pans, and let cool completely on racks, tops up. In a small saute pan over medium heat add the unsweetened coconut and toast until lightly browned 4-5 minutes. Toss and stir the coconut to avoid burning. To assemble, remove parchment paper from the bottoms of cakes. Split each layer in half horizontally with a serrated knife. Set aside the prettiest dome; it will be used for the final layer. Place another domed layer, dome side down, on the serving platter. 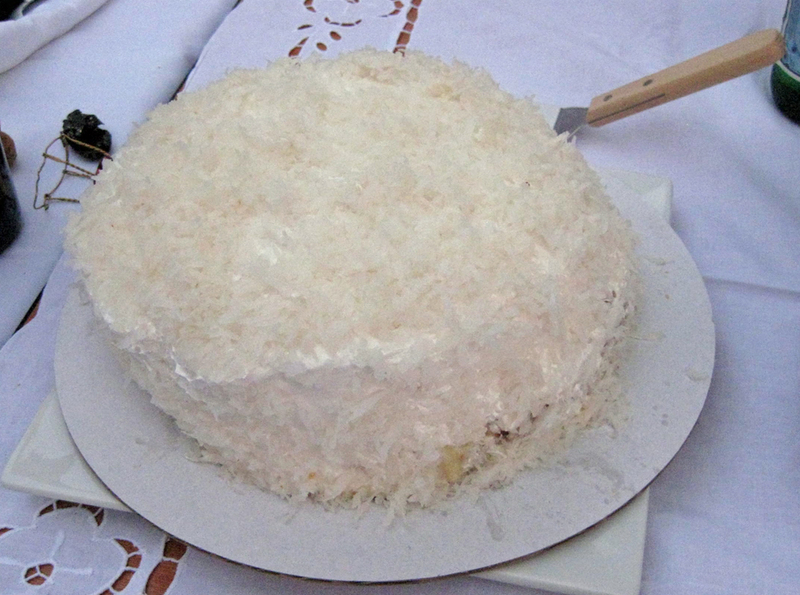 Sprinkle 2 to 3 tablespoons of toasted coconut over the cake. Spread a generous 1/2 cup coconut-rum pastry cream over coconut flakes. Repeat sprinkling and spreading process on the remaining layers until all but the reserved domed layer are used. Top cake with the reserved domed layer. Transfer cake to the refrigerator to firm for 1 hour. Remove from the refrigerator, and frost the outside of cake with seven-minute frosting. Sprinkle remaining coconut flakes all over cake while frosting is soft; do not refrigerate. Cake can be left out at room temperature for several days. Place egg yolks in a large bowl; whisk to combine; set bowl aside. Combine sugar, cornstarch, and salt in a saucepan. Gradually whisk in milk. Cook, stirring, over medium heat until mixture thickens and comes to a boil, 10 to 12 minutes. Remove from heat. Whisk 1/2 cup hot milk mixture into the reserved egg yolks to temper. Slowly pour warm yolks into the saucepan, stirring constantly. Cook slowly, stirring, over medium-low heat, until mixture begins to bubble, 5 to 6 minutes. Remove from heat. Stir in coconut extract and rum. Transfer filling to a medium mixing bowl. Cover with plastic wrap, pressing the plastic against the pastry cream to prevent a film. Chill until firm, overnight, or at least 8 hours. Meanwhile, in the bowl of an electric mixer fitted with the whisk attachment, whisk egg whites on medium speed until soft peaks form, about 2 1/2 minutes. Gradually add remaining 2 tablespoons sugar. Remove the syrup from the heat when the temperature reaches 230 degrees (it will keep rising as pan is removed from heat). Pour the syrup in a steady stream down the side of the bowl (to avoid splattering) containing the egg-white mixture, with the mixer on medium-low speed. Beat frosting on medium speed until cool, 5 to 10 minutes. The frosting should be thick and shiny. Use immediately.